Snow-capped mountains, active volcanoes, glaciers, black sand beaches and waterfalls graced with rainbows. Sounds like a passage from a fantasy novel, right? But no – it’s all real, and can be easily found throughout the South Coast of Iceland. 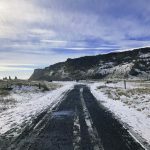 It is the month of March and our Southern Iceland Adventure Tour began in Reykjavik, taking us from the interior until Route 1: Iceland’s renowned “Ringroad.” In this area, snowy mountains and clouds of water vapor shape the surroundings. Geothermic centers dot the landscape, which also produce the majority of the country’s energy supply. The springs’ locations draw the eye as well; totally isolated from the island’s population at the foot of faraway mountains. As we pass by, I can’t help but feel for the men and women who work there, who contend with this brutal terrain regularly in their daily commute. Later, we pass by some volcanoes hidden by snow where fire meets ice. Once outside of the interior of the island, the landscape begins to change. An impressive contrast of mountains, plains, and bodies of water appear out of nothing, and greenish colors emerge through the melting snow. It was a truly magnificent sight. First stop was a viewpoint of two picturesque mountains, which hide in their shadow a small farm. The contrast between vibrant shades of green, the blackness of the volcanic rock, and the dazzling white snow is very characteristic of the breathtaking scenery in Iceland. You can see a glitter of the mighty Eyjafjallajökull volcano glacier in the background. Our second stop was a short lunch break in the service station in the small village of Vík í Mýrdal, which is the southernmost village in Iceland. It also happens to sport the best view that I’ve seen yet. Out front, a small town rests below a towering, partly snow-covered mountain, and behind us lies another volcanic beach which has these huge rocks of lava standing in the ocean named Reynisdrangar. Together with the crags and mountain terrain, the whole scenery around the place creates a spectacular viewing. Our third stop and on the way back was the famous glacier, Solheimajokull. Water, snow, and ice. Here the three states of matter live together, between the mountains and the glacial waterfall, simply stunning. Fourth stop was the peculiar black sand beach and basalt formations in Reynisfjara. A truly unique and incredible place. Apart from the scenery, the raw, unbridled force of the ocean takes center stage. The powerful waves crashing upon the blackened shores is a sight worth seeing, but only with due caution, as those same waves could just as easily sweep away an expecting bystander wanting a closer look. The return to Reykjavik didn’t fail to surprise either. The sunset furnished the landscape with an even more diverse palette of color, and made for pleasant viewing on the way home. The experience was made much more interesting and entertaining thanks to the driver-guide of the tour operator Bustravel Iceland. During the trip, he shared with us his knowledge about the area in a fun and informative way. It’s always great to learn from the locals, and in this case, clear up some false rumors about the area! This part of the island has much to offer any traveler, but especially for those who seek adventure in an incredible setting. Route 1 from Reykjavik is brimming with views that have to be seen to be believed, and despite how amazing the above photos may seem, they unfortunately cannot do the place justice. I recommend that you take your time on your journey, and that you don’t feel pressured to see everything at once. Instead, enjoy each place at your own pace, and in depth – these places weren’t made to be rushed through. Take your time, and take it all in!